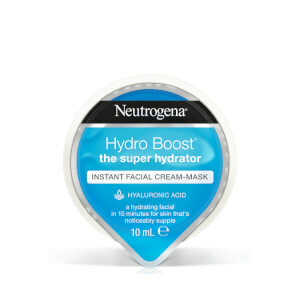 Introducing NEUTROGENA® Ageless Boost Instant Facial Cream-Mask. This lightweight cream-mask enriched with adenosine gives you all the benefits of an anti-ageing facial in just 15 minutes for a youthful and smooth skin. Use whenever skin needs an instant boost, up to 3 times a week. Apply on its own or multi-mask. Apply to cleansed skin and let absorb for 15 minutes. Massage in any excess product until completely absorbed or remove excess with a cotton pad. [PR-018547], Aqua, Butyrospermum Parkii Butter, Glycerin, Caprylic/Capric Triglyceride, Dimethicone, Ethylhexyl Palmitate, Cetearyl Alcohol, Tremella Fuciformis Sporocarp Extract, Adenosine, Caprylyl Glycol, Isohexadecane, Tocopherol, Plukenetia Volubilis Seed Oil, Glyceryl Stearate, Polysorbate 60, Polysorbate 80, Sorbitan Oleate, Sorbitan Stearate, Sucrose Cocoate, PEG-100 Stearate, Hydrolyzed Hyaluronic Acid, Sodium Hyaluronate, Silica, 1,2-Hexanediol, Acrylates/C10-30 Alkyl Acrylate Crosspolymer, Sodium Acrylate/Sodium Acryloyldimethyl Taurate Copolymer, Disodium EDTA, Trisodium EDTA, Tromethamine, Phenoxyethanol, Parfum, CI 77019, CI 14700, CI 42090. 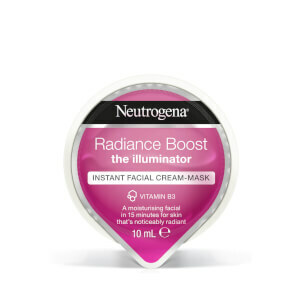 I used Neutrogena Ageless Boost Instant Facial Cream-Mask after a period of illness, when my skin was looking tired, dull and generally poor. I applied as per the instructions and noticed a slight tingle during the setting period. The texture of the cream was really thick, and would not drip. The scent was light and floral, without being overpowering. After 15 minutes, I removed the remainder with some cotton pads and was amazed with the result. My skin looked more youthful, hydrated and had more colour. My small lines had filled out too. I will definitely be buying this product in future, as it is a great step to add to my beauty regime. I think it's good but not life changing! It's a nice little luxury pot of face mask but that's about it, my face felt quite tight and dry after I used it and I don't look any younger! Think there's probably better ones out there but was nice to use. The packaging is lovely but can't be resealed as there's more that enough for one use that's a shame and a waste. The little tub is cute though and I like the branding. Overall I probably won't buy but was nice to try. This is a great product, FANTASTIC FACIAL in a Pot!! 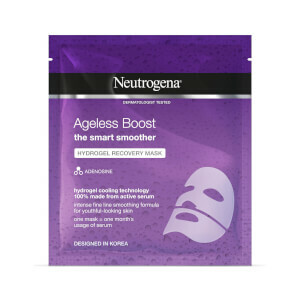 NEUTROGENA AGELESS BOOST!! On opening the packaging you can't help but notice the lovely fresh subtle scent. Used the cream as per the instructions, left on for 15 mins, then massaged the excess in. This cream is thick, silky & feels lovely on the skin, not heavy. I would definetly recommend to try this, I will certainly be purchasing again. Super supple and hydrated skin! So when I opened this I first noticed the smell. Its lightly scented, the smell is nice but if you have sensitive skin you may need to be careful. I popped it on for the 15 mins and then massaged the cream left into my skin - I then went to bed (you could only do this if you are going to bed as my skin was rather shiny so if you was to use this during the day you would have to remove the excess after the 15 mins) But WOW...when I woke in the morning my skin felt amazing, SO soft and supple. It also looked noticable hydrated and my fine lines were reduced. I would recommend this cream as a perfect over night treatment. A little goes a long way. I was very sceptical when I saw what looked to be a catering sized portion of jam or similar! (It wasn't red, but in that style of packaging......) Peeking back the foil lid revealed a creamy thick lotion that smelled absolutely divine-reminiscent of a 5* spa smell. I applied a layer to my clean face, then relaxed for 15 minutes as per the instructions. Upon removal I was amazed-super soft skin that felt so much more refreshed. It was simple to use and the 15 minutes relaxing time is something I never do, so loved that. It's now over two weeks since I used the product, and I purposely did not review immediately as I wanted to see how long the effects lasted. Two weeks on and my skin is still feeling better than it originally did. Do I look 10 years younger as I was hoping? No, I don't, but my skin certainly feels it, so that in my mind means inside I feel 10 years younger-so I must be?! I loved this face mask, first of all the product looked attractive in the packaging. It gives the appreance of being been a quality upmarket product without the designer price tag. The face mask itself was easy to apply and smelled lovey. After using this mask my skin felt lovely, smooth and soft and those pesky fine lines around my eyes were a lot less noticeable. I pull definitely recommend this face mask. It's a lovely product and well worth a try. I loved this cream. It goes on nice and smooth, very moisturising without leaving my skin greasy. Skin feels great after. Smell gorgeous too. Luxurious feeling and with good results! This cream-mask is lovely and silky, with a smooth cold-cream like texture and a noticeable but not overpowering fragrance. It feels like a rich night cream, but is supposed to be applied quite thickly and left to soak into the skin for 15 minutes. Once the time is up you can either massage it in or wash the remainder off - I have tried it both ways and found that when I haven't rinsed away the excess I've woken up the next day with slightly clogged pores on my nose and cheeks, so I've stuck to gently washing away the remaining cream with a warm flannel. I'm really impressed with how soft and plump my skin feels and looks after using this mask; it really does seem like an "Instant Facial". I like leaving the mask on to work its magic while I'm in the bath, as the warmth seems to help it really sink into my skin. Having used it every other day for a week I did notice a difference in the brightness of my skin, it felt better hydrated and just generally smoother, and I enjoyed relaxing in the tub with my mini-facial mask on! The only downside for me is that because it is so richly moisturising, if I do rub any into my skin and leave it on (as it says you can), it blocks my pores and starts to give me minor breakouts. So I'm unable to use it as a "cream-mask", and instead just stick to using it as a mask that I wash off thoroughly after use - and I'm very happy using it like that!